It’s time to tackle your holiday menu with the zeal of an athlete. From appetizers and stuffing to sauce and desserts, this menu has it all. These are THE bomb and will make your friends and family wonder if you’ve secretly been attending culinary school at night. 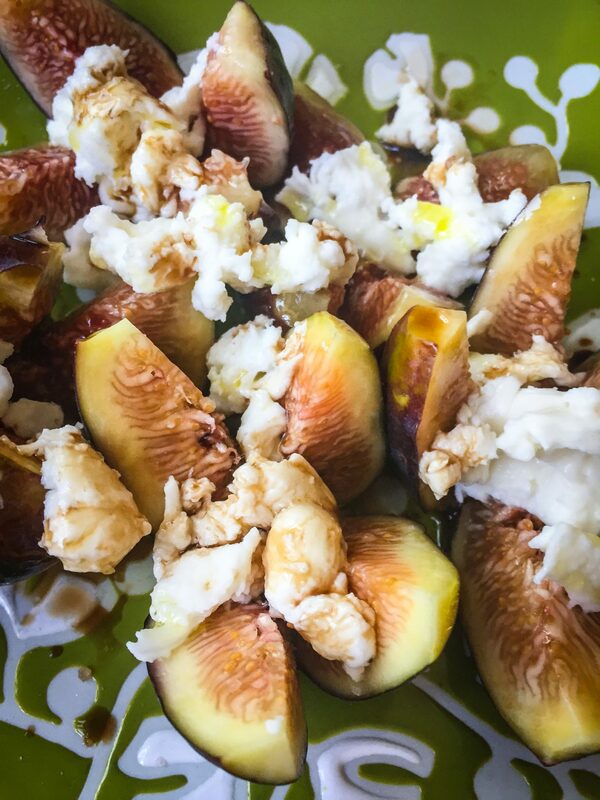 All you need are nice ripe figs, some fresh mozzarella, balsamic glaze, and a little sea salt. Either slice the figs or sit them on their big bum end and cut into quarters, not quite through to the bottom. To get fancy, top or stuff with chunks or slices of mozzarella, drizzle with glaze, and sprinkle with sea salt. Optional toppings include basil, ripped into small pieces, and prosciutto. The perfect sweet and savory mix here to impress your guests early in the meal. Stuffing, at least in the United States, can make or break your holiday meal and it should never EVER come from a box. You will be judged by your stuffing, so this is where you get to practice your newly acquired culinary skills in flavor balance and use some of the season’s best ingredients. The core of stuffing is the bread, so don’t skimp here. Buy beautiful, high quality sourdough bread. If you want to really show off your stuffing chops, use half sourdough and half cornbread. Toast the bread for about 5-7 minutes on a baking sheet in your oven (350F/175C degrees) until slightly crispy. In a large pan, sauté onions and/or leeks in olive oil. Add garlic, salt, fresh rosemary, thyme, sage, and pepper. Throw in big handfuls of chopped celery, mushrooms, and apples. Sauté until soft. Mix the sautéed vegetables with the bread cubes in a big bowl. Add about a cup of chicken stock and a few tablespoons of melted butter. You want the bread to soak up most of the liquid but not all of it. Throw in some pomegranate jewels at the end. Transfer your mixture to a casserole pan (or two). Bake with tin foil on the top at 350F/175C for about 25 minutes. Take off the tin foil and bake for another 10 minutes or so to make the top crunchy. 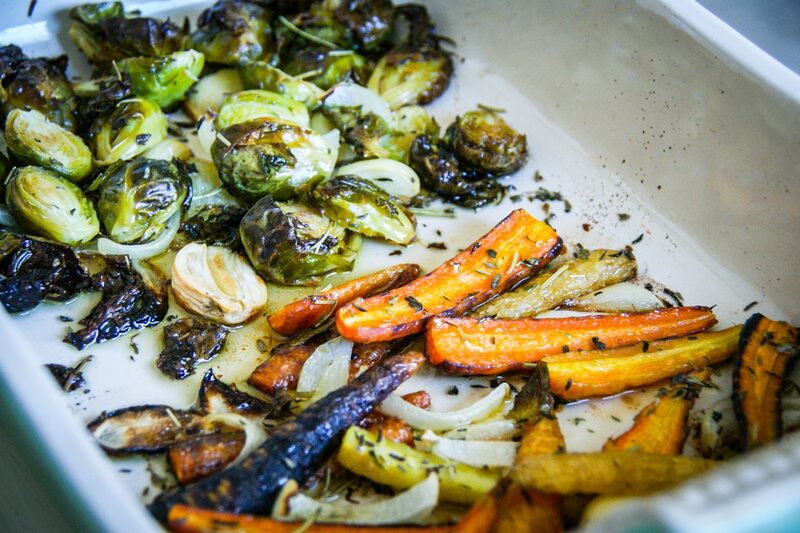 Typically, I roast veggies at 400F/200C degrees for 25-35 minutes or until they look done. The goal is to get some crisp – make sure you arrange on a baking tray so they aren’t piled on top of each other and save the sprinkle of salt for AFTER you take your superstars out of the oven. Salt brings water out of your vegetable and makes it soggy. A little burnt flavor goes a long way! Get your roasting dish ready! Swap soggy broccoli and brussels sprouts for crispy greens with a tangy glaze. 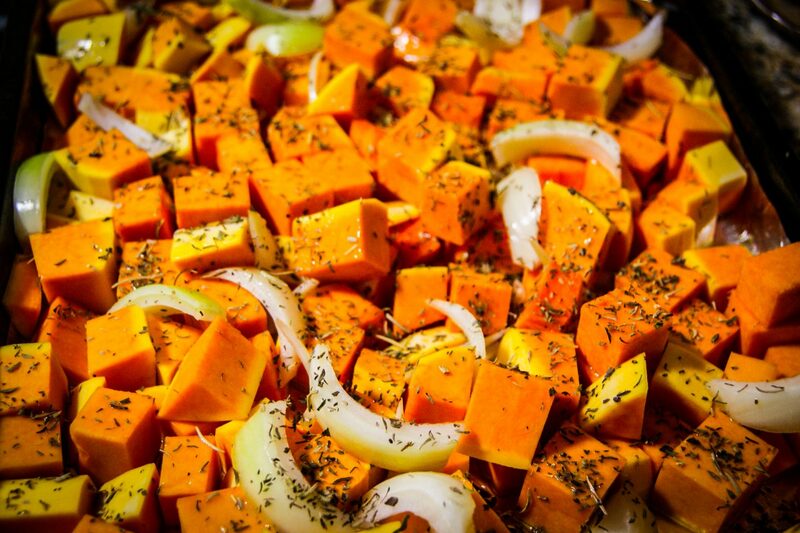 Let your spice cupboard loose on your butternut squash. Sage and thyme are my favorites for this side. Cabbage in a salad…really? Yes! Try finely chopped kale with apples, almonds and goat cheese. Roasted Broccoli: Don’t walk away. Roasted broccoli is deliciously addictive if done correctly. You will actually start cooking this for yourself on a weekly basis. Cut into medium bite-sized pieces and toss with lots of garlic and olive oil. Roast and, before serving, toss with a small squeeze of lemon juice and a shake of salt. The balance of flavors is crucial here. Not too much salt or lemon, but just enough to give your tongue a little tingle. Roasted Beets: Slice beets and roast with lots of olive oil. Top with a sprinkle of sea salt and goat cheese or thin slices of parmesan. Roasted Brussels Sprouts: Either cut the brussels sprouts in half, grate on a cheese grater, or pick the leaves apart and toss into a pan. Roast with lots of good olive oil and garlic and some herbs of choice, like thyme. After pulling them out of the oven, top with a shake of salt and squeeze of lemon and toss into a bowl. You can also top with a nice squeeze of balsamic glaze, parmesan, or almonds. Get creative with your flavor combinations! Roasted Carrots: Cut and roast carrots with olive, garlic, and thyme. Sprinkle with salt when they get out of the oven. Roasted Squash: The typical roasted squash star is the butternut squash, but winter brings many varieties with which you can experiment. The traditional method is it peel the squash, spoon out the seeds and “guts” and cube. Toss with olive oil, onions or shallots, and spices such as thyme or sage. Roast until slightly crispy on the top and sprinkle some salt and pepper at the end. Blend with broth or stock for an amazingly delicious squash soup! Glazed Carrots: Peel carrots and make a nice glaze of butter, splash of water, honey or maple syrup, thyme, salt, garlic, and maybe a little orange juice or zest in pan on your stovetop. Submerge the carrots in the glaze and simmer for about 20 minutes until tender. Extra presentation points if you keep some neatly trimmed green stalks on the top of the carrots and plate stylishly. Forget canned cranberry sauce, the real deal can be made ahead of time and is worth the extra effort. Cranberry Sauce: Don’t you dare serve canned cranberry sauce ever again. 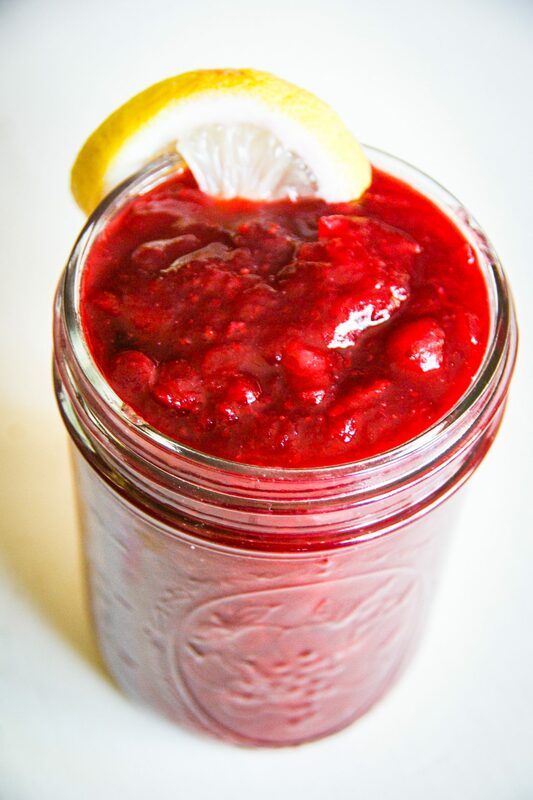 Homemade cranberry sauce is too easy to make and too delicious to buy from the store! Seriously, this recipe is stunningly delicious and simple. And you can make it ahead of time. Pour a bag of cranberries (fresh, not frozen) into about a cup of liquid, either water or red wine. Add fun things like freshly squeezed orange juice, grated fresh ginger, cinnamon, cloves, and brown sugar or maple syrup. As the liquid comes to a boil, the cranberries will start to pop and the whole mixture will become thick and syrupy. Just keep simmering until you reach the desired consistency and taste. Make sure you taste along the way to get the perfect flavor. You can make this recipe ahead of time and keep in a jar in the fridge. People will be eating this by the spoonful, so make a lot! Spiced Syrup: Very similar to your cranberry mixture, just without the cranberries, spiced syrup is an impressive and versatile holiday staple. It can be used not only to give your cranberry sauce a kick in the pants, but also boost the flavor for poached or baked pears, apple pies, or alcoholic beverages. Start with water (or wine) and something sweet like sugar, brown sugar, honey, or maple syrup in a sauce pan on medium heat. Add some or all of the following: grated ginger, cardamom, cloves, cinnamon, vanilla, citrus juice or zest, and pepper to infuse the syrup. Keep heating until think and syrupy. Don’t lick the pan until it cools completely. 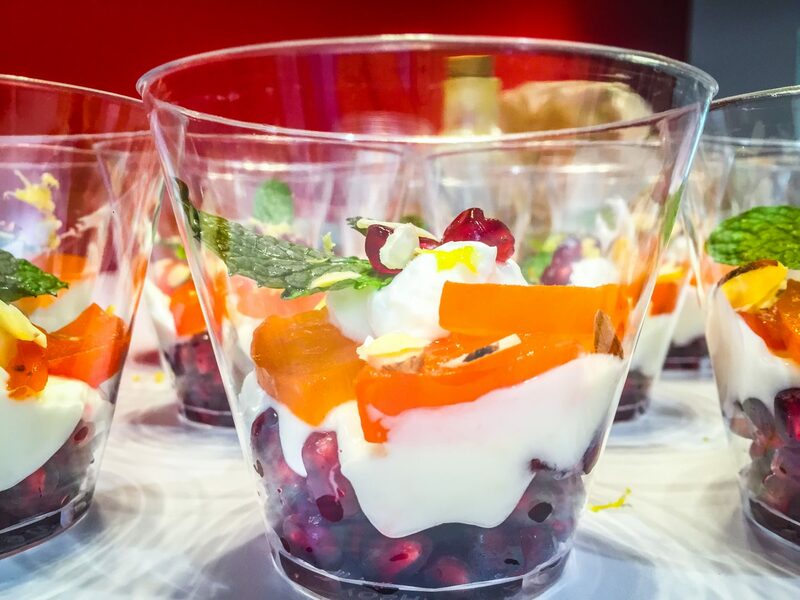 Round off your meal with these pretty and healthy persimmon fruit parfaits. Baked Spiced Pear: Cut pear in half and core out seeds. Cover with the spice infused syrup mentioned above in a very small baking pan to keep the liquid close to the fruit (or put it all into a tin foil package). Bake 15-20 minutes at 350F/175C with the center side down, then switch and bake for another 10 minutes with center side up until very soft. Serve with vanilla ice cream, yogurt, or mascarpone and top with walnuts or pistachios. Persimmon Fruit Parfaits: This is my very own creation that I brought to a work potluck one year. It was a hit flavor-wise, and also happens to be pretty darn healthy. The trick is finding persimmons that are fully ripe. These are tricky to find, but if you happen to pass some very squishy persimmons at the store, definitely seize the opportunity to give this recipe a try. If you can’t find the perfect persimmons, you could use other season fruits (maybe infused with spice syrup) like cranberries, pears, or apples. Use a glass bowl or cup so people can really admire the colors of this little dish. Start with a layer of pomegranate jewels on the bottom. Mix some good Greek yogurt with a little honey and lemon juice and zest (in my opinion, a higher fat content yogurt tastes much better). 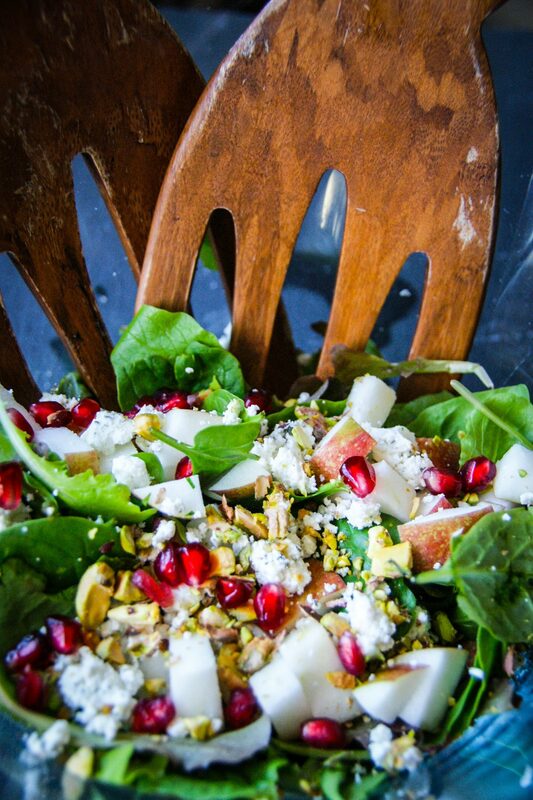 Add a big layer of the Greek yogurt on top of the pomegranate. 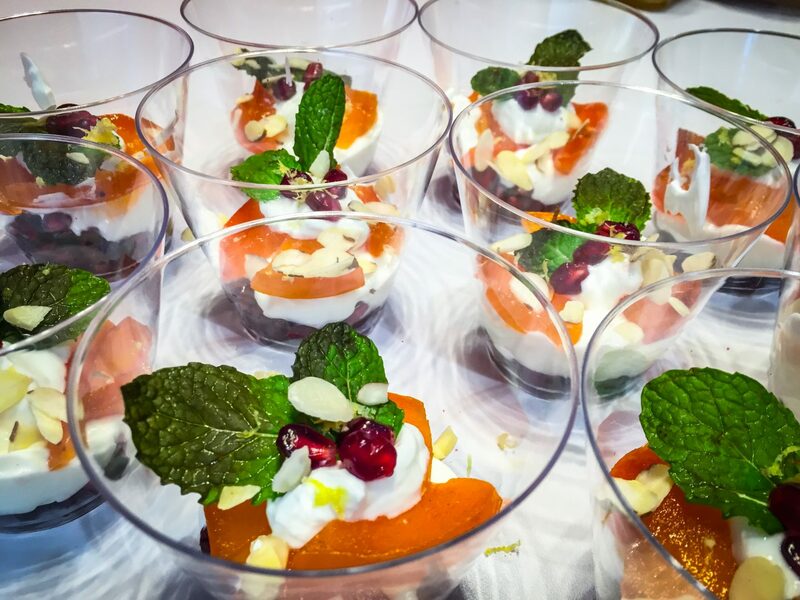 Cover the yogurt with a few juicy slices of persimmon and top the parfait with a few more pomegranate jewels, lemon zest, mint leaves, and almond slices.